Trainer David Payne didn’t hesitate to approach stewards to successfully gain permission for Momentum To Win to carry 0.5kg above his allotted weight at Wednesday's midweek meeting at Hawkesbury. Payne has booked his stable star Ace High’s 2017 Spring Champion Stakes and Victoria Derby winning jockey Tye Angland to ride Momentum To Win at 56kg in the Hawkesbury Race Club Motel Class 2 Handicap (2000m) in a determined bid to lift the gelding back into the winning list. Animal Kingdom four-year-old Momentum To Win is yet to score in six starts this season, and Angland hasn’t been aboard him in any of his 22 starts to date, although he did ride him in a 910m barrier trial at Rosehill Gardens in June as he was being readied to begin this current campaign. “I particularly wanted to book Tye for Hawkesbury as he is a difficult horse to ride,” Payne explained. “If you bounce him out, he can bolt with you. “He has to get cover in his races and needs a strong boy on top to do that. Tye fits the bill. Momentum To Win has won twice, the latest when another experienced senior jockey Josh Parr rode him in a Hawkesbury Class 1/Maiden Plate, over the same distance as tomorrow’s race, on March 21. Payne, who has spelled Ace High following his Melbourne Cup unplaced run behind Cross Counter at Flemington last Tuesday, takes five horses to the Hawkesbury meeting. His other runners are Commentator (Clarendon Tavern 3YO Benchmark 64 Handicap, 2000m), Dream Child (Robert Oatley Wines Maiden Handicap, 1000m), Heavenly Thunder (Easy Lane F&M Maiden Plate, 1300m), and Rock Zone (TAB.com.au CG&E Maiden Plate, 1300m). Angland also rides Commentator and Heavenly Thunder, whilst Keagan Latham partners Dream Child and Jason Collett rides Rock Zone. Though Payne expects Momentum To Win to run well, he is also keen on Commentator’s chances. “I feel he is the best of my runners,” he said. The three-year-old has raced only four times and, following a last start third over 1900m at the Canterbury night meeting on October 26, is ready to step up to 2000m at his third start this preparation. Payne owns 50 per cent of the gelding, who races in the Ace High colours, and cleverly named him after well-known Sydney race caller and analyst Mark Shean. 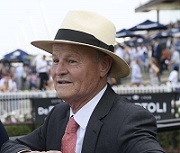 Fellow Rosehill trainer Gary Moore has withdrawn Hawkesbury hat-trick seeker Hostwin Epanoui (Glyn Schofield) from Momentum To Win’s race to oppose Commentator in the 3YO Benchmark 64 Handicap. Hostwin Epanoui (60.5kg) carried 56.5kg in winning a 1500m Maiden Plate on October 25, and then 57kg when taking a 1600m Class 1 Handicap at last Thursday’s Lander Toyota Ladies Day Cup meeting. In an interesting opening race despite the small field of five, Melbourne co-trainers Ciaron Maher and David Eustace will have their first Hawkesbury starter in Quality Approach (Brenton Avdulla). Like Hostwin Epanoui, the lightly-raced Dawn Approach three-year-old is backing up after finishing sixth to Ulusaba (beaten just under two and a half lengths) over 1800m at Royal Randwick on Melbourne Cup day. Prior to that, he broke through in a Kilmore Maiden Plate (1462m) on October 23. Avdulla, Hawkesbury’s premier rider last season, has taken mounts in four of the first five races. His other bookings are Amicus Agrippa (1000m Robert Oatley Wines Maiden), Heloise (1300m Easy Lane Maiden) and War Deck (1300m TAB.com.au Maiden). The rail is 3m out from the 800m to 400m and in the TRUE position for the remainder. A “Good 4” rating was posted this morning with a penetrometer reading of 4.86. RACE 1: QUALITY APPROACH, Hostwin Epanoui, Commentator. RACE 2: SWELT, Amicus Agrippa, Rosina Kojonup. RACE 3: ABOVE AND BEYOND, Evict, Kathaire. RACE 4: LEXI’S CHOICE, Sizzling Ace, Galina. RACE 5: EL COYOTE, Wokurna, War Deck. RACE 6: SHANTOU, Exellas, Skyray. RACE 7: WOLFE, Via Veneto, Ivy’s Court. RACE 8: MOMENTUM TO WIN, Devil’s Lair, Our Anniversaire.